Does UX Write have the ability to have it’s autocorrect be applied to a custom ios Keyboard app, or will it only work with Apple’s built-in keyboard?? I haven’t had a chance to test it with any third-party keyboards, but I expect the answer is almost certainly yes – when applying autocorrect it doesn’t care (or even know) where the input came from. Some people were surprised when they found out autocorrect works with the external keyboard, which I didn’t even implement consciously – it just came about as a natural consequence of applying the correction logic to all input. Note that UX Write implements its own autocorrection logic, rather than using the default iOS autocorrection, which is the reason for the different behaviour. Does UX write work from an external keyboard. Will the autocorrect and features still work Fran external keyboard? Yes, autocorrect works with the external keyboard, including in French. How does cross referencing work in ux write? And does it have the ability to work (cross reference) once I convert it to PDF? And still be able to use search to find words? In terms of how you use it: Under the insert menu, there’s a “Reference” menu item. This brings up a selection dialog where you can select any heading, figure, or table in the document. Currently the only supported reference format is the number associated with the item, though this will be enhanced in the future. In terms of how it works: Cross-references are standard HTML hyperlink elements (the ‘a’ tag), which reference #id where id is the value of the id attribute on the target element. During editing, everything is done in terms of HTML, but this gets translated to docx’s way of doing things on save, if that’s the format you’re working with. Currently there is no find or find/replace mechanism in UX Write itself, but this is coming soon. If you export to PDF then whether or not you can search the PDF will depend on the program you’re viewing it with. Thank You for replying to my post Mr. Kelly, you were very helpful, do you know of any PDF apps that will allow search and reference both. Off the top of my head I can’t think of any such apps. I don’t really do a lot of PDF reading on my iPad (primarily I use Kindle for reading books) though when I do look at PDFs I use either Adobe’s reader or GoodReader. Actually – I’ve just checked GoodReader now and it does have a search feature. Thank You Mr. Kelly for the tip on GoodReader, I will check it out. Any time frame on the next update for UX Write and what new features will you be implementing? I don’t have any timeframes – it’s notoriously difficult to predict how long certain features are going to take so I avoid making promises unless I’m certain I can keep them. But I’m still following the roadmap in the getting started guide; all those features will be coming eventually. Right now I’m working on improving language support (specifically Chinese & Japanese, and preparing the user interface for translation into a number of different languages that will be done by another company). I am also tidying up a number of small bug fixes. 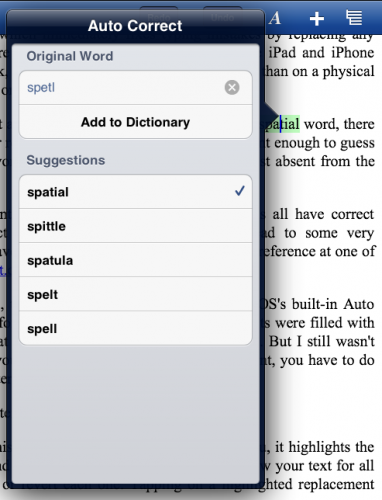 Next major feature is find & replace plus spell checking. I’m heading off to to the US for WWDC and some meetings over the next couple of weeks but will be back on development after that. Don’t apologize for the price. At $15 this program is a steal. It truly is a useful content creation tool. Add find and replace and the ability to handle docx files and I’ll be able to do 90 to 95% of what I use a word processor for. I’m sure Word can do table of contents but it would take me awhile to figue it out. Here it is easy. The automatic outlining and the ability to rearrange so easily is great. I don’t think Word can even do that. Mellel does outlining but neither it nor Word can touch it on price. I like you philosophy of content creation being separate from content formatting. I use Ulysses on the Mac quite frequently for that very reason. My only request is to make the program compatible with the new Logitech keyboard which has some editing keys very similar your soft keyboard top row. I do like how you still keep that top key row available even when an external keyboard is used. However without the touchpad area available it doesn’t work as well as when using the full soft keyboard. Perhaps a pop up touchpad area when using the edit keys whenever a keyboard is attached? Word does actually support a table of contents (just go into Insert/Indexes and Tables), but it doesn’t get updated automatically (you have to manually do an “update all fields” or explicitly click on it), which isn’t very convenient. I’ll have a look out for the Logitech keyboard next time I go shopping. I have an Apple bluetooth keyboard at the moment which is partially supported, though I still need to get cursor keys and keyboard shortcuts working. The main problem is that Apple doesn’t provide an API for getting direct access to keyboard events, so I’m going to have to use a really ugly workaround to provide support for these (I’m planning a post about this later). But I’ll have a look at the logitech keyboard and see if it’s possible to support the extra keys in some way. Also regarding the additional keys when using the external keyboard – they’re not actually supposed to be displayed (this is a bug). All of the formatting functionality on that row is available via the menu, the punctuation keys are present on the physical keyboard, and once arrow keys (including cmd/shift left and right for movement and selection) are there won’t be a need for it. Looks VERY intriguing but I’m having a hard time justifying spending $15 on an app just because it looks good. Tempting, it’s true. If you sold a limited version for $1 you might get me to try it. At the very least, I need to see what kind of documents it produces. I should be able to read a sample document produced by UX Write for free. Hi Bob, that’s perfectly understandable. I’m actually in the process of re-typing my entire PhD thesis in UX Write both to show that it’s possible and also as an additional form of testing, and will publish that once it’s complete. I’ll consider putting together some smaller documents to show off its features and make these available on the website. The PDF output isn’t perfect. I’m relying on WebKit’s built-in PDF rendering facilities and there a few cases where it puts page breaks in inconvenient places. I may be able to work around some of these problems, though I’m expecting improvements in this area in iOS 6. I anticipate the PDF output being most useful for draft versions, with the final print-quality versions being produced on a computer using MS Word or LaTeX. If you’re unsure about the app, I suggest you wait a little while until there are some more reviews out (there are a bunch of sites which will be posting reviews in the next few days). If you want, I can email you a PDF of my 330-page thesis which was generated from UX Write, so you can see what the output is like. I haven’t put this up publicly on the website because the thesis itself wasn’t written in UX Write and contains features like citations which UX Write doesn’t yet support, and I don’t want people to be mislead into thinking it does. But this will at least give you an idea of what the PDF output is like. I’ve not downloaded yet, but it looks like there is some great thinking going into this app. I’m all for styles and structure being at the forefront, since I’m a publisher. Things I’d very much like to see in the app in addition to what already appears to be contained: (1) Word compatibility of course (2) Regular Expression (RegEx/GREP) find and replace – Textastic has done an amazing job of this for iPad text editors (3) highlighting, and (4) if at all possible split screen document editing. …. and if I really start wishing then XML integration and export so that I can work on files that can be imported into InDesign. Hi Anthony, thanks for your comments. 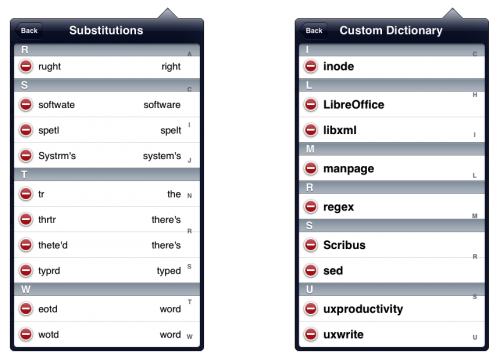 As I’ve mentioned elsewhere, Word support is coming soon and it’s my top priority in terms of major features. Regular expression support is something I’ll have to give some thought to, since there are going to be some complexities in this in the case where a match crosses multiple paragraphs, but when I get to implementing find & replace I’ll see if I can make it work. By highlighting, could you be a bit more specific? Are you referring to the ability to set the background colour specifically for a run of text inside a paragraph? Split screen editing would be very complex to implement as it would require a separate instance of the web browser control, and logic to keep both versions in sync. I’m not sure if this is going to be technically feasible to do. Regarding XML integration, I’ll be looking into this further down the track, at some stage next year. My plan is to get all the basics done, and then look at the more specialised features like fully structured editing and integration with content management systems. But this will be quite a while off. Thanks for this information, I meant by highlighting the regular highlighter pen functionality in OpenOffice and Word. In terms of split screen I was thinking side by side and something akin to InDesign’s stripped back story mode (which also works well for viewing XML tags). While I don’t think the app should be priced as low as $1 (see Bob Lieberman’s comment), and that you have a right to charge whatever you wish. I think that as an early adopter of apps that I would be willing to pay £3.99 (UK Sterling) for the app in its current form; £5.99-£7.99 once Word functionality is added (including footnotes); up to £12.99 with RegEx support (esp. if that includes find and replace based on format, e.g italics, and styles like Word); and if you added split screen editing as well £15.99. Alternatively, I’d be happy to receive a promo code and to review the app on my blog.